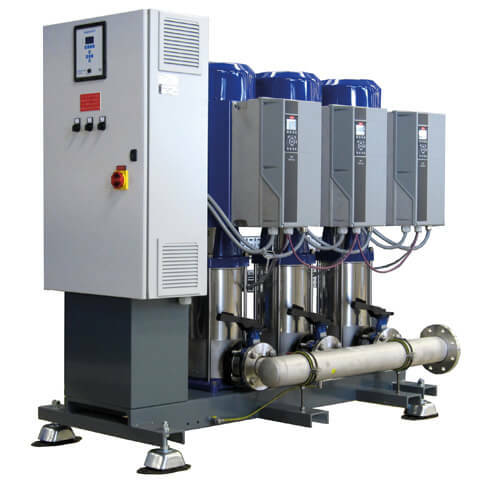 The pressure boosting systems from the Utility Line, with a maximum of 6 pumps and a capacity of up to 840 m3/h, are the biggest powerhouses in the pressure boosting systems range for drinking water and slightly aggressive liquids. 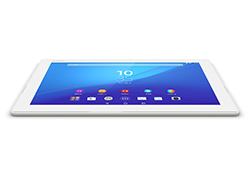 They offer a solution for applications that require high capacity or head and where reliability must be guaranteed. All around the world, hospitals, luxury hotels, factories and entire towns are using these modular stainless steel systems for the transportation of their (drinking) water. This series of systems offers countless designs to meet the specifications of your project. Our broad experience and direct lines to development and manufacturing departments offer customisation, as well as unprecedented flexibility to adapt to extreme challenges concerning the delivery or specification. The Utility Line pressure boosting systems deliver great performance, yet they are designed to be very compact; the system fits through an 80cm standard door with the pressure pipes dismantled; flexible installation and set-up remains possible in small spaces. 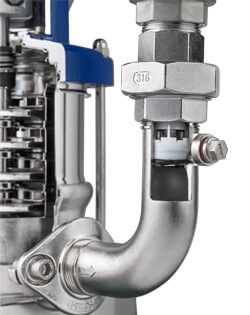 Integrated check valves in the discharge bend save space and reduce the number of connections compared to separate check valves. In addition, the location of the switch box is flexible, either in the technical room, or in a place of choice next to the system.This innovative design also makes the systems easily accessible for quick maintenance. 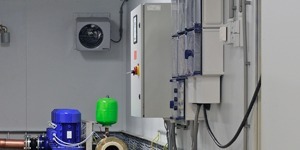 The Utility Line systems comply with the strictest future European directives for drinking water. All metal parts that come into contact with the medium are manufactured from AISI 304 or AISI 316. Simple and responsible replacement of one pump without dismantling the suction and pressure pipes can be easily achieved with this series of systems. The Utility Line is equipped with the discharge pipe mounted on corners so that the pumps can be sealed and easily dismantled while the other pumps remain in service. Thus, the systems that are dependant on this system can remain in service and occupants or users will experience little or no disruption during the maintenance or replacement. In demanding environments with a lot of demand and high loads, energy consumption is an important factor. The smarter the water pressure can be provided, the less power required. And that ultimately results in a welcome reduction of the energy bill. There are important factors that ensure the Utility Line is a very energy-efficient choice. 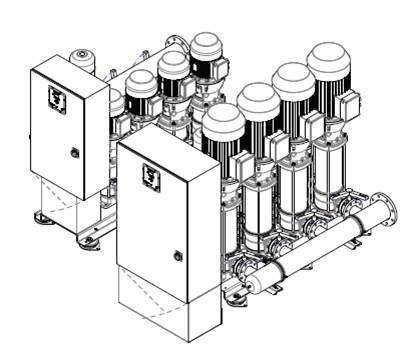 The heart of the Utility Line is formed by the vertical DPV pumps that are developed, improved and manufactured by us in the Netherlands in accordance with the latest energy standards. The advanced hydraulic system with high Minimum Efficiency Index (MEI) values, modern motors (IE3 or, on request, IE4) and a smart control system ensure the operating point is well regulated and therefore, they belong to the class, "most energy-efficient water pumps." Where possible, we advise the use of a large, continuous flow-through accumulator to build up and release the pressure as evenly as possible when designing a system for an apartment building. This means the energy used up during the "mandatory" overrun of the pumps can be stored instead of wasted. Our own test set-ups have proven this method provides substantial savings. 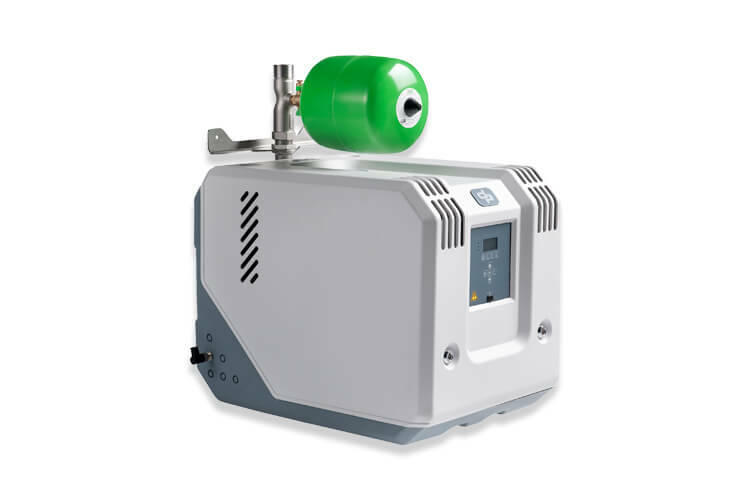 The application of speed control on the Hydro-Unit pressure boosting systems also ensures considerable savings in energy costs. Minimal pipe loss is taken into account in the design of the systems through the application of butterfly valves and ball valves with a full cross-sectional area and generously sized pipes.